Home / Ace hardware / our home / sm / sm advantage card / SM Appliance Center / SM Department Store / sm hypermarket / SM Supermalls / sm supermarket / The SM Store / watsons / Women's Wednesdays Sale / SM Supermalls Celebrates Women’s Day! SM Supermalls Celebrates Women’s Day! 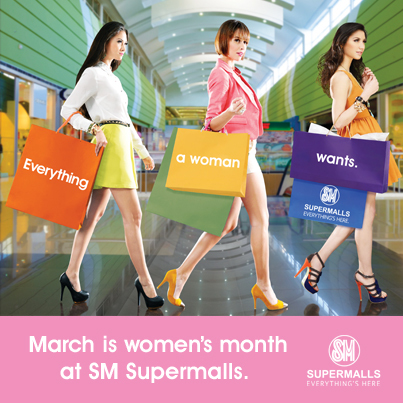 I know, we are already half pass the month of March, but did you know that this month, SM Supermalls is pampering women on this special month by offering them shopping with discounts and special treats from participating stores at all SM Supermalls via Women's Wednesdays Sale! Yes, on all Wednesdays of March, all lady customers will receive astonishing discounts and treats from Watsons, Ace hardware, Our Home, The SM Store (the new name of SM Department Store), SM Supermarket, SM Hypermarket and SM Appliance Center. From the house of best brands that offers competitive price and high quality private labels, Watsons, all its lady customers will instantly get 10-percent off on a minimum Php1,500.00 worth of purchase. Watsons is offering more than a thousand of brands ranging from personal care items medicines, cosmetics fragrances to general merchandise. Meanwhile, at Ace Hardware, women will receive a 5-percent discount on every Php3,000.00 single receipt purchase on all regular priced items. Known for being an ultimate one-stop-shop for the latest solutions for home improvement, there are 40,000 home improvement solutions that you can find at Ace Hardware. From its core products, which include building materials and outdoor merchandising, hardware and power tools, paints and sundries and electrical and plumbing. As for Our Home that offers a wide selection of lifestyle furniture and home accessories, lady customers can avail of the 5-percent discount for a minimum Php15,000.00 purchase on all furniture. They are also entitled to the 10-percent discount on all accessories, upon the minimum purchase requirement of Php5,000.00. At SM Appliance Center, with its established reputation for value and quality services in the marketing of home appliances, women will also get 10-percent off on selected items. All of these amazing treats will not be complete without the SM Department Store - now The SM Store - and SM Supermarket and/or SM Hypermarket shopping escapades. And at The SM Store an exclusive discount will be given to women who has their SM Advantage Card. The SM Store will deduct 10-percent from their total bill if they shop Php3,000.00 or above worth of items, single receipt. Lastly, women’s shopping will not be complete without the groceries. And so, at SM Supermarket and SM Hypermarket, lady SM Advantage Card members will receive double points for their SMAC when they purchase on Wednesdays. So, girl friends, with all of these discounts and freebies, I juts wishing that you are enjoying your special month! Happy Women's Month to all of you ladies out there! Group hug!! !